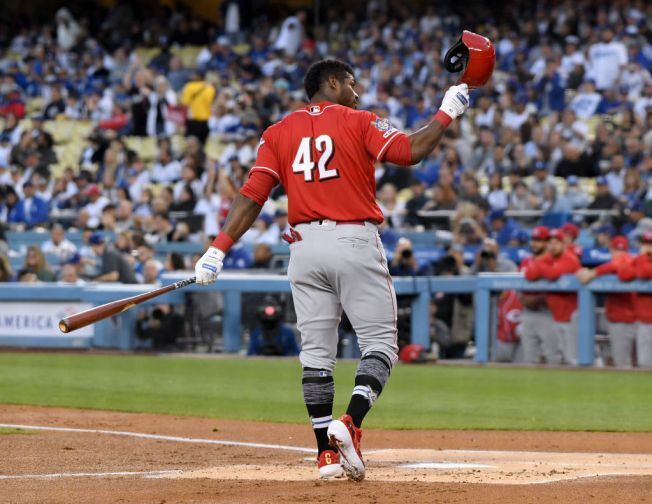 Yasiel Puig's return to Los Angeles on Monday night featured the best and worst of the mercurial fan favorite known as the "Wild Horse." It was the best of Puig, it was the worst of Puig, it was the day we celebrated Jackie Robinson, and it was the return of Clayton Kershaw. After 45 minutes of waiting for Yasiel Puig, Cincinnati Reds Vice President of media relations, Rob Butcher, sauntered to the podium and tested the audio on the microphone. The words that came out of his mouth next came as no surprise to the Los Angeles media gathered in the Dodgers interview room. "Yasiel Puig is late. In fact, he isn't even in the building yet," said Butcher. "I don't know what else to tell you folks, I'm sorry." While Butcher was at a loss for answers, most of the media simply chuckled and smiled. We've seen this before from the mercurial Puig, and we know it's simply part of the performance. Thirty minutes later, Puig finally arrived, over 75 minutes later to his first press conference back at Dodger Stadium since he was traded to Cincinnati in December of 2018. When told in Spanish that the media had been waiting for him, Puig shrugged and said, "I was hoping they'd all leave." Not only did nobody leave, but everyone was fixated on the return of the Wild Horse, the player that captivated Dodger fans for six seasons, but also had us banging our collective heads against the walls throughout the years. "I'm excited to be here. I miss this place because of all the fans coming every day for six years," said Puig. "I don't know how many people, how many fans have been coming here, but I'm sure when I played here there were more fans than there are now." Puig said he was "excited to see his old teammates," and minutes later he got his wish as Dodgers' closer Kenley Jansen barged into the room and threw a football at Puig. The two embraced and said hello before Puig went back to answering questions about his new teammates. In what could have been taken as a jab against his former team, Puig praised the newfound camaraderie with his teammates in Cincinnati. No longer is he looked at as the black sheep in the clubhouse, but as a veteran and a leader for many of the younger players in the Reds organization. He called Joey Votto, "the best guy I've ever met in my life," and spoke highly of Eugenio Suarez and how he's welcomed him to the team since day one. "That's one of the most beautiful things I have with my new team," Puig said in Spanish. "This support, and to be by each other's side every day and talking in the locker room, on the bus, on the flight, and on the field, off the field, we always have good communication, and that's what makes me not feel as much nostalgia as you might think I would feel for the Dodgers." Puig said he might cry if fans chanted his name during his first at-bat. Not only did they chant his name, but they gave him a standing ovation as he stepped out of the batter's box and doffed his helmet to the crowd. He then promptly proved why he was such a fan favorite has he crushed an 87MPH slider to dead center for a two-run homer in his first ever at-bat against Kershaw. "I've never faced him before," Puig said before the game, calling Kershaw, " The best pitcher in baseball now." Kershaw's best days might be behind him, but his former teammate greeted him with a bang and a bat flip in their first meeting, pointing to his family and friends behind home plate as he rounded the bases and touched home. He may be with a new team, in a new city, wearing a new color, but for Dodger fans, Puig was home.